Description: CSX 5809 leads an intermodal freight east at Fairfax, SC in 1992. This line is the former C&WC/ACL/SCL route running from Augusta, Ga. to Yemassee, SC. The curved track to the left allows trains to leave this line and head south to Savannah, Ga. on CSX's S Line. The S Line is the former Seaboard Air Line route from Columbia, SC to Savannah, Ga. Description: CSX B36-7s 5863 and 5850 lead the Ringling Brothers "Blue Train" past the Amtrak Depot. Amtrak P42DC 23 rests two tracks over with train No. 19, the southbound Crescent. Title: Sitting in Junta Yard. Description: Q541 rounds the curve on the main line heading south with a B36-7 leading a HLCX SD40M-3,HLCX ex MPI SD40-2 and the EMD SD70M-2 demo unit #75. Description: The southbound CSX local backs down the main while NS 3412 waits for a clear signal to proceed. 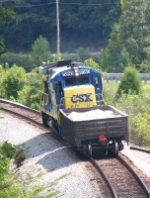 Title: CSX 5850 rolls past the Athens Branch Junction. Description: A local work train ambles thru New Hope.